Chroma key compositing typically uses a green or blue screen to key a particular color to be recorded as transparent. 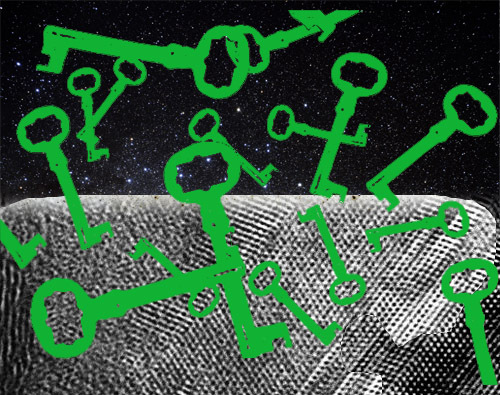 In the example above, I have placed green keys on a cosmic (astrophysical + microphysical) background to give an idea of how to conceive of the relation between publicized and privatized experience. The green of the keys represents the intrinsically singular sensitivity which is ‘behind’ the key silhouettes, just as wearing a green shirt on camera in front of a green screen chroma key will, in a sense, portray your shirt as a ‘receiver’ of the composite image. This metaphor is closer to what I propose for psychophysical unity – not so much a Receiver theory of consciousness where the brain acts as an antenna for metaphysical signals, or an Emergent theory of consciousness where brain functions accumulate as a representation of signals, but as a Divergent theory in which sensitivity is whole within its private frame of reference, but fragmented across what appears to be space and time from the perspective of a similarly keyed sensitivity*. Consider that if you are far enough away from a mosaic, it looks like an image, but if you are very close, you see only colored tiles. The difference in spatial ratios on our visual sense influences whether we see the artist private-personal intentions to express the picture’s content, or their public-impersonal technique in placing tiles. If instead of a static mosaic tiles, we think of it as a dynamic television screen of pixels, the metaphor can be extended through narrative time. The pixels do not tell a story, but the image does…over time…to a human audience. The pixels are not “producing” the story, nor are they “receiving” it, although there is both receiving and projecting of electromagnetic sensations on the public-impersonal level. The complexity of the sequence of patterns on the screen also does not produce the story either, and no amount of complication within the hardware will cause stories to be experienced, just as no degree in the complication of a plot will cause the story itself to become sensitive. Patterns are representations within experience, not experiences themselves. Consciousness is not the green of the key, it is the transparent sensitivity that the green represents. If there is receiving or emerging, it is sensitivity receiving sensitivity, and sensitivity emerging from sensitivity. *Sensitivity here could mean ‘person’ or ‘observer’ but I want to make it clear that what I propose does not depend on human like experience. I see all forms of observation as participation, and I want to break the automatic association that we have between experience and Homo sapiens personal subjectivity. For pansensitivity to replace energy or information as the primordial identity, it must be understood that all objects, forms, and physical conditions diverge from the totality of sense (not just primitive sub-personal sense, but the whole band of sub-personal, personal, super-personal, and impersonal sense). So, do patterns then lend themselves to conventional meaning through language and culture? I think that patterns are meaningful to the extent that they satisfy multiple levels of receptivity and expectation. Each channel of awareness that contributes to our experience is always accumulating new sensitivity through experience. Whether it is association with our first hand sensation, or indirect familiar experience through language and culture, we are always accumulating new expectations and new pattern recognition opportunities. To say that patterns have meaning is not as simple as it seems. For us to recognize a pattern (not just visually or sensationally, but semantically, thematically, emotionally, etc) is to say that we are already presented with a representation of meaning on our sub-personal level. When we ask whether patterns gain meaning through language, we are asking about another, personal level of cognitive pattern recognition and association. Often, in symbol grounding arguments, it is assumed that meaning is a one-dimensional property which things either have or do not have. This reveals just how biased we are toward intellectual properties and overlook perceptual depths. If I see “ความรู้สึกความสมจริงหลาย”, I will not be able to understand what it ‘means’, but I can guess that is an example of writing from a South Asian language. A five year old American might not pick up on that, but they can get a sense that it is from a language that they aren’t familiar with. The amazing thing is that our visual perception of the language changes as we learn it. We no longer have to convert squiggles into meaning, we actually see the word as coinciding with meaning in a familiar way. We don’t have to read meaning into them, the meaning is already present in our sub-personal experience of the world and the word.